Get the beading instruction you want as you learn beading techniques and how to use those techniques to make your own original art with seed beads. After the basics (which you may already know), we'll offer a series of projects to help you develop skills handling the beads plus some art skills to help you develop something that is truly your own. Well, of course you know that we are not a real university. Neither are we one of those outfits that sends you email promising you a college degree by midnight tonight. All we have in common with those folks is that neither of us are Real Universities. But we do have beading instructions, and even cute Certificates of Completion for many of our projects. We'll show you examples, give you the steps to follow, provide some design ideas, and help you get going. Then you can show your finished projects to the rest of us; it's a great way to get used to sharing your work with the world. If you have questions or comments, you can send them in, using the comments forms that appear on some pages, or the contact form that you can reach through the bar of buttons on the left side of your screen. Bead Embroidery Basics Discover the satisfaction of creating a beaded picture with bead embroidery. 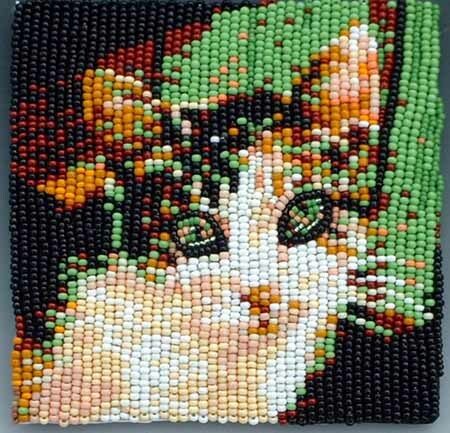 One simple stitch is enough to get started creating your own pictures in beads. Beading Art with Seed Beads: A Bead Embroidery Picture We'll draw a very simple still life, then bead it. You can mount the finished bead embroidery on a small box if you wish. You will find full instructions for this free bead project when you click on this link. Enhance Your Bead Pictures with Contour Lines. Building on the still life we did in Bead Embroidery 101, we'll add directional contours to the beads to give the illusion of depth to our picture. Bead Painting from A Photograph. You can make a bead painting by transforming a photo into your own piece of bead art. Here is a complete demonstration of taking a photograph and turning it into a piece of bead embroidered art, complete with easy step-by-step instructions and hints to use along the way. Making a smooth transition from one color to another is a useful skill. Let's start playing with color by practicing smooth transitions from one color to a second color. You can see examples and get ideas, instructions, and a challenge to do a piece of your own and share it with the rest of us. Learn how to make a spiral rope from clear step-by-step instructions. You will also find some hints for proper tension in a spiral rope. Attaching Clasps to Spiral Ropes lets you complete a necklace or bracelet. We'll consider types of clasps, their benefits and drawbacks, and how to attach them. Designing Spiral Rope Patterns is fun and can be done intuitively once you know the basic stitching pattern. Here are some factors to consider as you play with Spiral Ropes. I hope some of them inspire you in your beading.